The Portland-based Filipino-American artist, who blends folk, rock, classical and punk, is already making a name for herself. “You must all be freelancers,” Portland singer-songwriter Haley Heynderickx said to the crowd. 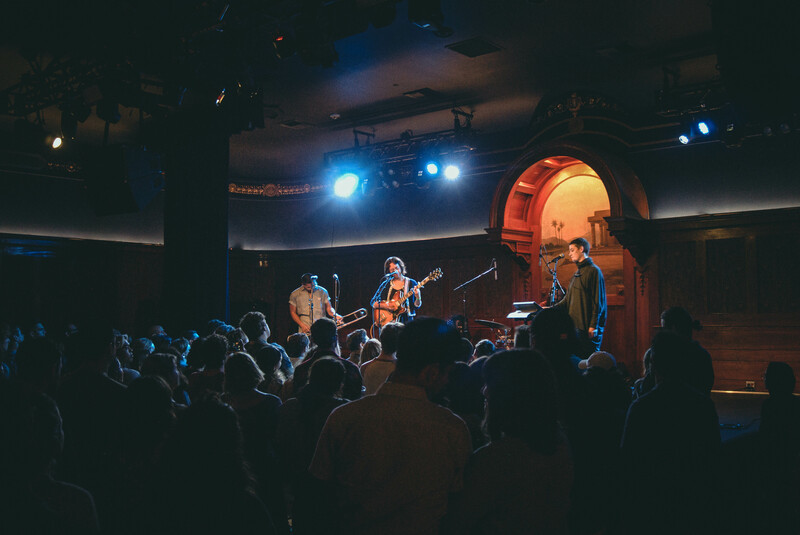 Heynderickx, a fairly new artist on our radar who has been making waves on NPR and Rolling Stone for her beautifully unguarded indie folk tunes that manage to blend folk, rock and punk, made her LA debut at the Lodge Room in Highland Park Monday night. Fresh off the release of her debut album I Need To Start A Garden — a project she mentioned had come with its fair share of struggles (routine recording sessions had started, scrapped, and started up again due to varying technical difficulties) — Heynderickx brought her full band for a week-long West Coast Tour, starting in Johnsville, CA, to San Francisco, Los Angeles, and back home to Portland, OR and Seattle, WA this week. Upon first listen of her music and breakout single “Oom Sha La La,” Heynderickx is a delight. Her guitar strings are warmly plucked; her voice is both fragile and gentle; her music unpredictably soft and loud; and her backing band gets into a groove and sings-along to a head-bopping chorus. 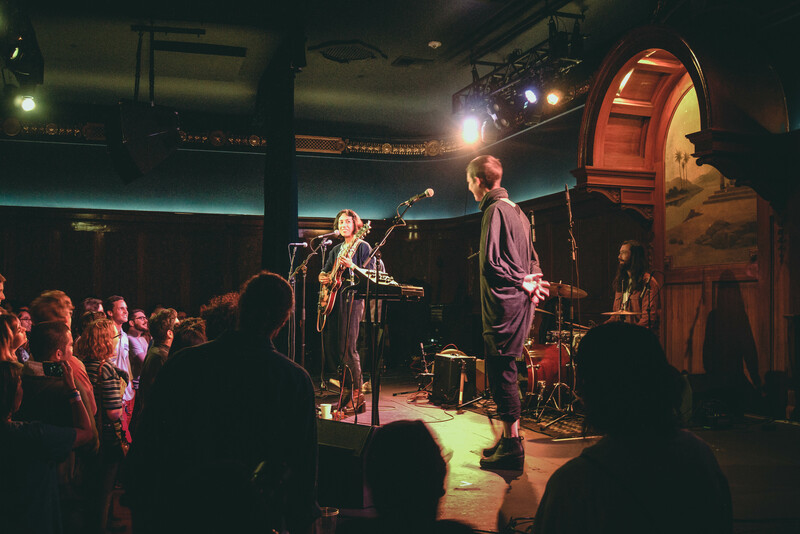 Her recorded music takes on the ambiance of an intimate live room session — echoey and hollow — as an artistic choice to bring the live performance straight to the listener’s bedroom. As a performer, Heynderickx is endearingly awkward and confident. Her quirky nature and candid banter with the band — full with a trombone, keys and drums — was a delight to watch. As an audience, we felt a part of her performance. She commanded the attention of a dedicated and supportive crowd, in love with her lush arrangements and songs that are both intimate and other times unpredictable — sometimes singing in plain fashion, other times in a mild yell. During a moment of changing tuning for the next song, she challenged the crowd to meet and talk to someone new, as if it were part of the song. As her guitar string audibly slung into a different tuning, it was moments like that that made you smile. Heynderickx’s dry sense of humor and soft-spoken nature are just a part of what makes her charming. Her lyricism and use of imagery in her music makes her standout as a refreshing and promising new artist in the folk world. Her songs are layered in detail, oft with introspective lyrics, ghostlike vocals and heartfelt sentiments of love, loss and confusion. In songs like “The Bug Collector,” her intricate fingerpicking style played to whispery vocals about collecting and clearing out bugs show both her musical deft and lush lyricism. As she sings about fear and clearing out the bugs “to prove that nothing’s out to get you,” the song is both fun and sad — tinged with metaphors of getting rid of one’s demons — as a bellowing trombone plays in the background. With the emergence of breakout Asian-American musicians, akin to the angsty indie rock of Mitski and folk sentiments of Thao Nguyen, Heynderickx upholds her own soft and beautiful style of folk. Her lyrics are both introspective and expressive, with the ability to paint pictures in your mind; her music is incredibly artistic, tasteful and self-aware; and, as the Filipino-American artist was happy to see some other Filipinos in the audience, she has already been drawing in dedicated crowds. I’m sure we’ll be hearing more of Heynderickx soon. Her music sticks and haunts with a raw honesty and sincerity that you didn’t know hit you — and I’m loving it. Follow Haley Heynderickx online on Facebook, Twitter, YouTube and Instagram. I just attended an event yesterday evening where Haley and her band played her in Portland and what a gem she is. I watched from the second row and watched closely how her band interacted within the group and how she spoke to the crowd was very genuine. Hours after the event I found myself humming to myself and I’m sure I was off key but that did not matter I was still in the moment and enjoyed every minute of it. I suggest to at the very least if you cannot see her live then find her on YouTube. You will not regret it. Haley you were fantastic and I love the band too.